These libraries include high-level methods (of class MatrixTable) with table-valued parameters, as often required in analytics or business intelligence. Finaquant Calcs is dispatched with a 30-day trial version. Finaquant Protos is free, and requires no license updates for permanent non-commercial use. Maximum table size is limited with Finaquant Protos to about 20’000 rows. You will need a permanent license for Finaquant Calcs for unlimited table size. Finaquant Calcs has also some additional calculation engine features like Nodes & Networks to build modular and extendable structures for complex rule-based computations, workflow integration, configurable input validations, stepwise calculations and so on. You will find two folders: One folder is for examples in C#, other folder is for examples in VB.NET (Visual Basic for .NET). 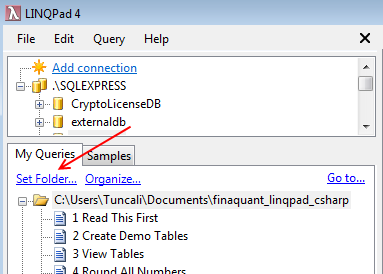 4) Open LINQPad, set folder to one of the two folders (csharp or vb.net) you have unzipped in the previous step. 5) Copy the content of query file Extensions to the global My Extensions. These are custom extension methods that will be available to all queries. finaquant is the name of the database where all table-valued parameters (i.e. input & output tables) will be stored. Uncheck all Data Context Options; these options are not required. “Pluralize EntitySet and Table properties” adds an “s” to the end of table names; an undesirable feature for our examples. 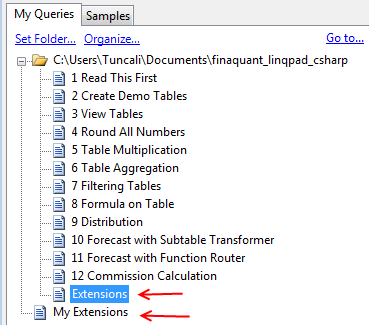 Don’t forget to enter the namespace, “FinaquantCalcs” or “FinaquantProtos” and press OK. You may also press the button “Set as default for new queries” if you want to create new queries with finaquant’s table functions. Just select the query you want in “My Queries” window, and press the arrow button (or F5). 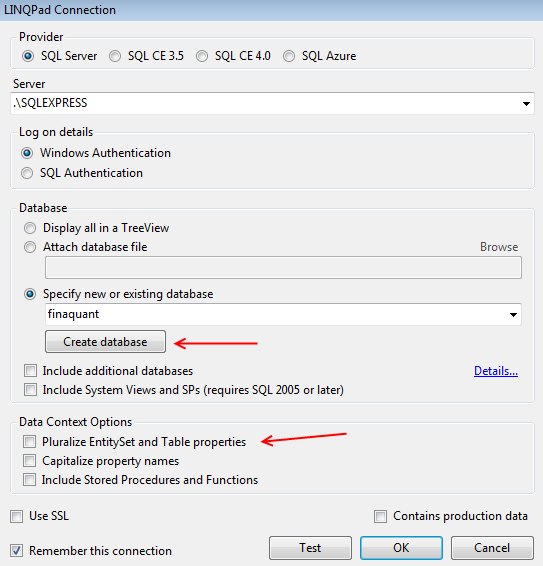 First run the second query (Create Demo Tables) to create all the input tables that will be required for all the other examples. The examples from 3 (view tables) to 8 (distribution) are included for getting started with table functions. The examples from 9 and above demonstrate the real power of high-level table functions: Simplicity of implementing seemingly complex computations! You may need to get used to the idea that data tables are just parameters for finaquant’s table functions, like matrices for matrix functions in linear algebra. 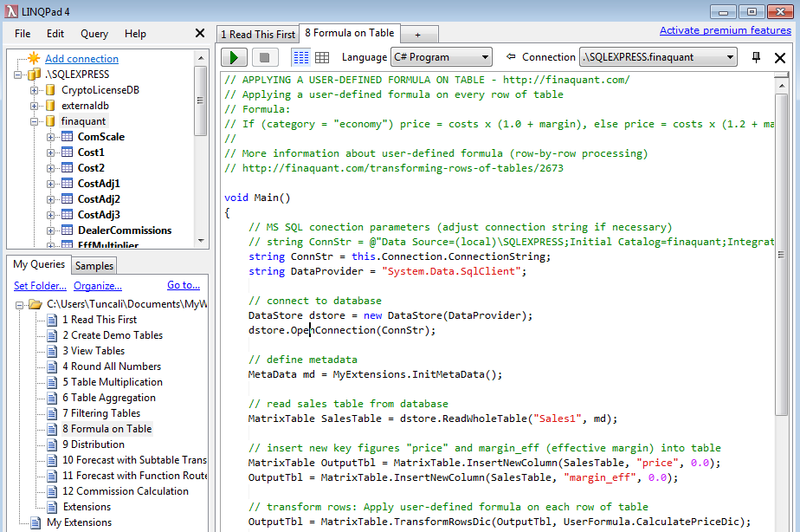 In that sense, finaquant’s .net libraries offer methods for table algebra. When you store and read parameters in/from a database, you are in fact storing and reading table-valued parameters. You read first some input tables from the database into in-memory tables of type MatrixTable (finaquant’s class for representing data tables). You make some calculations with these in-memory tables using the table functions (without any connection to the database) to generate some resultant (output) tables. 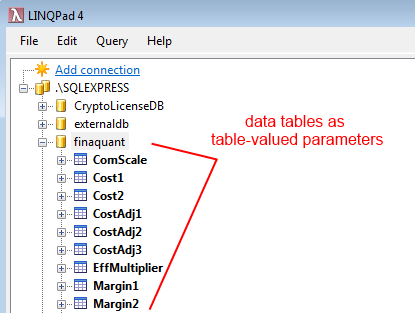 If you want, you can store table-valued output parameters in the database, either for applying some queries on them (LINQPAd is an ideal tool for this purpose), or for using these tables as input parameters to subsequent calculation stages. Any questions or comments? Please direct them to finaquant’s community forum. This entry was posted in Calculation engine and tagged demo, integration, LINQPad, table functions, test data, tutorial. Bookmark the permalink.